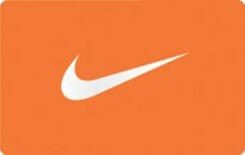 Earn 7 SB per $ when you buy Nike gift cards at MyGiftCardsPlus, powered by Swagbucks. It's the gift that always fits perfectly! Nike Digital gift cards are good for gear online or at any Nike-owned retail store. The Nike Gift Card is redeemable for merchandise at Nike-owned retail store locations (NIKETOWN, NikeFactoryStores, NikeWomen, NikeClearanceStores, NikeStores) in the United States, Puerto Rico, and on Nike websites, including NikeStore.com and NIKEiD.com. Upon redemption, any unused balance will remain on the Card for future purchases. Card balance is redeemable for merchandise only, and will not be redeemed or exchanged for cash except where required by law (MA residents may request a refund on a credit card if 90% of the Card value is used).